Print all topics in : "Understanding terrain datasets"
Terrain datasets are based on a number of concepts. You can easily design, create, and work with terrains if you understand these main concepts. A terrain dataset is a TIN-based dataset that uses geodatabase feature classes as data sources. 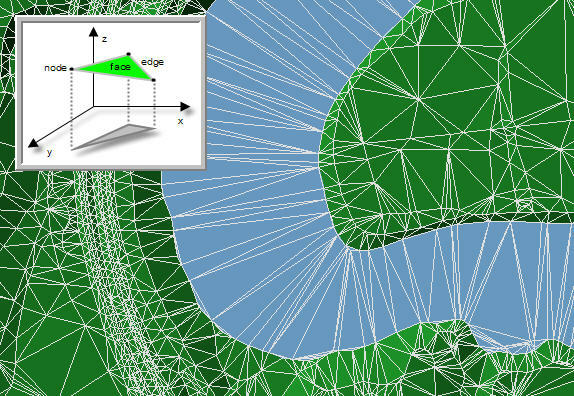 A Triangulated Irregular Network (TIN) is a data structure used to model surfaces, such as elevation, as a connected network of triangles. TINs are assembled from a series of data points with x-, y-, and z-values and partition geographic space into contiguous, nonoverlapping triangles (called faces). The nodes of each triangle are the elevation, or surface, points. Each triangle node has an x,y coordinate and a z surface value. Any surface value can be interpolated within a face or along an edge. A terrain dataset is a multiresolution TIN. It has a series of TINs, each of which is used within a specific map scale range. A coarse-grained TIN is used at larger map extents (such as when you are zoomed out to the entire study area). More surface points and increasing levels of detail are used as you zoom in and focus on larger map scales and specific map extents. As part of the process of creating a terrain dataset, you will define the number of pyramid levels, a working range of map scales for each pyramid level, and the level of detail at which you want to work with the terrain at each pyramid level. Two methods exist for creating pyramid levels: z-tolerance and window size. The level of detail for each pyramid level is defined by the z-tolerance or window size that you want to work with at that map scale.